The world-renowned fine wine region of Bordeaux has been producing exceptional vintages for over 2,000 years and we take a journey through natural landscapes, medieval bastide towns and iconic vineyards to discover the complex science of viticulture. We tour the famous medieval town of Saint Emilion, cross one of the longest aqueducts in France and enjoy many wine, cheese and Armagnac tastings from the comfort of the hotel barge Rosa, along the Canal de Garonne. This is a sample itinerary and is subject to change. On alternate weeks the cruise is operated in reverse. 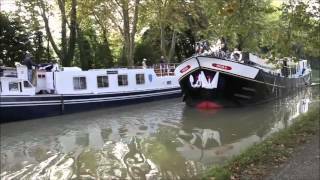 Guests are met in Bordeaux and transferred to Rosa hotel barge, moored at Castet-en-Dorthe. Meet the crew with a Champagne welcome aboard and settle in to your air-conditioned cabin before your first gourmet dinner on board. Rosa - Castests-en-Dorthe is an old Dutch “Clipper” barge that was completely refitted in 2010 to a high specification. The air-conditioned interior includes a dining room, saloon, bar and four staterooms. Two of the staterooms have double beds and two have twin beds, all of which have full en-suite facilities. Outside there is a spacious sun deck with comfortable furniture. Along with Anjodi, Rosa featured in the hugely successful television series, Rick Stein’s French Odyssey. After breakfast, we cruise downstream to Mielhan-sur-Garonne where we have lunch on board. Our afternoon tour is to one of the best known Bordeaux appellations, Saint Emilion, home to the first vineyard in the world to be listed as a world heritage site by UNESCO. Explore the historic ramparts, unique architecture and 200 kilmoetres of underground galleries criss-crossing the basement of the town. We then move on to a wine tasting at Chateau Beau-Séjour Bécot. Dinner on board. Our morning cruise takes us to the charming village of Le Mas d’Agenais where we visit the 14th century Chateau de Duras for the afternoon. We enjoy dinner ashore at a local auberge. We have the chance to enjoy browsing the local produce at Marmande’s colourful market this morning, before cruising further down the Canal de Garonne to pretty Damazan. After lunch we take a tour of the ancient church at Le Mas d’Agenais to see an original Rembrandt work before visiting a local cheese workshop for a tour and tasting. Dinner on board. This morning, we take the air-conditioned minibus to the local traditional cooperage of St Martin, before making our way to the Bastide village of Vianne and then on to Barbaste with its fortified mill and towers. After lunch, we cruise to Sérignac-sur-Garonne. Dinner on board. Today, we visit the medieval town and castle of Nérac, following in the footsteps of King Henry IV, before we take a tour and tasting at the Armagnac producer, Domaine de Lapeyrade. Our final cruise takes us across one of France’s longest aqueducts, measuring 1,900 feet, over the River Garonne to Boé. Captain’s Farewell Dinner on board. After breakfast, guests disembark Rosa and are transferred to the designated drop off point in Bordeaux.